If you're considering having a pool installed in your backyard, choose the right type of pool decking for your pool. The right deck increases the safety of the pool while complementing its appearance, and is just as important a decision as choosing the pool itself. 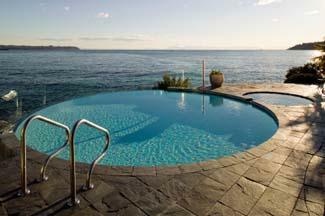 In most cases, the type of pool installed dictates what type of deck it needs. An in-ground pool requires decking materials that are installed flat and at ground level; an above-ground pool requires an actual structure built so the deck's platform is even with the top of the pool. Wood decking materials are one of the least expensive options for above-ground deck building. While it is one of the easiest materials to build with, there is a lot of maintenance involved with wood decking. In order to keep the decking looking its best and to prevent it from rotting, routine staining, sealing or painting is required. Composite materials are gaining in popularity since they often look cleaner than wood and are made with man-made materials like polymer resins and plastics, which don't rot as quickly. Composite materials are significantly more expensive than wood but don't require staining, painting or routine maintenance. Research does show that composite boards can rot over time if the material isn't treated with a preservative when it's manufactured. Poured concrete is only used for in-ground pools. While it is generally inexpensive, concrete can be a problem in Eastern states where the weather changes very quickly. When subjected to rapid changes in temperature, poured concrete pads can crack. On the other hand, concrete is a malleable substance, which can be manipulated to look like brick or stone and can even be color-customized. Concrete pavers are similar to poured concrete decks in composition. The concrete is usually poured offsite into pre-made pavers and then installed on-site piece-by-piece. Whereas poured concrete has to cure and harden on-site, concrete pavers are ready for installation when they get to your home. This type of pool decking, like poured concrete, is subject to damage from drastic temperature fluctuations and very cold winters. A stone deck can turn your in-ground pool into a natural-looking oasis. While more expensive than many other pool decking options, stone does add a beautiful touch to any design and can even be manipulated from time-to-time for a fresh look. Stone decking usually incorporates a variety of stones, from large boulders to foot-friendly pebbles, to create an original look each time. Tiles make an elegant and clean looking deck, although it's important to use only unglazed tiles. Tiles that have been glazed are extremely slippery and may cause slips and falls. Tiles come in a wide assortment of colors, styles and sizes, and while installing them can be tedious work, the results are stunning if installed properly. When building your own deck, follow the instructions to the letter; a raised deck has to be able to safely handle the load of however many pounds it's rated for. Build it right the first time and your pool decking should provide you with years of durable service.